At Crowdpac, we believe that there are too many barriers to running for office today. Our political system is designed to make it easier for insiders ... to decide who runs. Our political system is designed to make it easier for insiders – the party machines, the big-money donors, and the special interests – to decide who runs. It also favors the two major parties, since unless you’re a wealthy individual, it’s hugely daunting for independent (or independent-minded) candidates to raise the resources needed to mount a campaign. But that’s exactly what we need in order to restore faith in our democracy and make it more representative. Today, we’re taking a major step toward making elected office more accessible for everyone by launching the first crowdfunding platform for U.S. politics. Now anyone can turn their community into their political network to build the support they need to get elected. 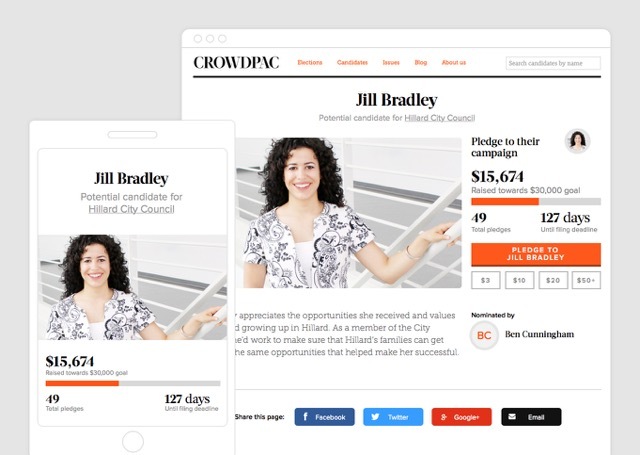 Crowdpac’s new political crowdfunding platform reduces the barriers that prevent many people from running for office – in particular the cost and hassle involved in raising money. Because our platform operates on a unique pledge system that does not charge users unless candidates actually enter a race, there’s no need for expensive lawyers or campaign consultants – anyone can nominate a potential candidate for office (or nominate themselves) by creating a crowdfunding page in just a couple of minutes. We hope to encourage the best among us to run for office – not just wealthy insiders. 3. Preview and publish the page! Supporters who pledge money will only be charged if the candidate opens an official recipient committee to receive and spend money for the specified race. When that happens, the money will go straight to their campaign account along with all necessary contact and reporting information. What can you do? We want your help recruiting and empowering a new generation of political candidates taking the plunge into electoral politics for the first time. Think of the most talented and effective leader you know and let them know it’s time for them to serve by nominating them to Run for Office on Crowdpac. 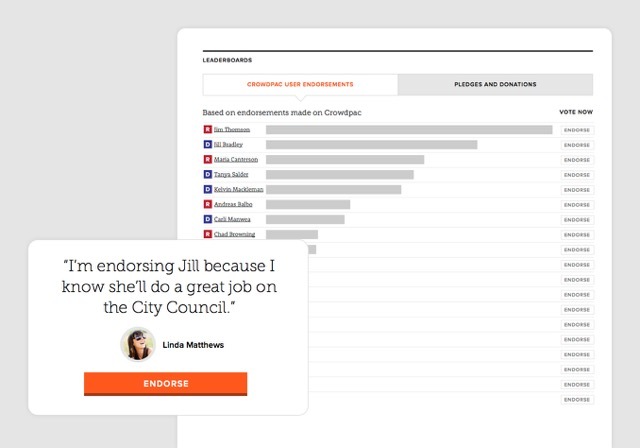 You’ll be able to tell their story and collect pledges and endorsements for any elected office in America, be it school board, city council, state senate, or even Congress. If you think you’d be the best person for the job, you can even nominate yourself and use Crowdpac to help build the support you’ll need to win. Just as other crowdfunding sites have helped new causes and ideas attract investors, it’s time politics was opened up in a similar way.